She had a troubled childhood and wrote her memoirs published in 2008 “mon père” ; my father, related to a "traumatic" story with her him. A nice Filmography career, since 1960 until 1989; about 50 movies. She is not a real Blond. She preferred colouring her hair Blonde... and she did well! 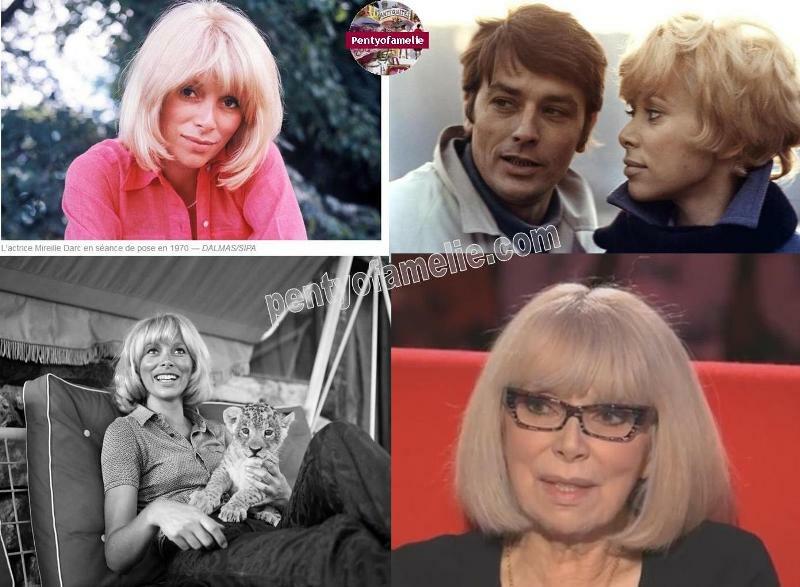 An exclusive Actress acting various roles mainly Comedy, many directed by the Talented Georges Lautner, Gilles Grangier, Michel Audiard... That particular band of buddies did welcome and considered Mireille Darc as another Mate of the band, in a world mostly ruled by Nice guys though:) Indeed, they did not see her as just another “blond actress” wearing skins of felines:P or faux fur in her clothing and accessories, with a perfect body… However in some movies, she had to play "nu de scenes", and for sure everyone on set was a bit hum ... “confused”. She starred in "The Tall Blond Man with One Black Shoe". She wore an awesome demure high-necked black-velvet dress designed by her friend Guy Laroche, she turned around and showed that the dress is backless, displaying discreet buttock cleavage. Partner Actor as Pierre Richard was not informed of the filming sequence details though. He had to open a door and joined Christine in her apartment… and? Anyway :) the most interesting about Mireille's career is yet to come below. Through 1980s, her career was interrupted by open-heart surgery following a car accident, in which she was seriously injured, and her separation from Alain Delon after fifteen years together. She quit her film career, but returned to television in the 1990s. A fantastic comeback bringing together Mireille and Alain, performing at Theater, Famous “The Bridges of Madison County" on 2007. Documentary Films, another great talent, she directed no less than 13 TV documentaries. In 1992, she directed her first TV documentary about "la deuxième vie" ; a new life began, based on organ donation and transplantation. Then, in 1994, "brève rencontre" ; brief meeting, telling background of p rostitutes lifestyle. Two years later, another documentary about cancer ; "le doute et l’espérance"; from Doubt to Hope. Later, about women released from prison "de l’ombre à la lumière"; Out of the Shadows at Last. In 2005, an extraordinary doc about women acting in p orno movies. "une vie classée ..." ; a way out of p orn Industry. In 2015, about "Elles sont des dizaines de milliers sans abri!" ; Tens of thousands women left homeless! "Death? death is familiar to me, never been so close to, I know what it feels like". All her documentary Films go straight to the heart, to the heart… and left you "breathless"
how Talented she is filming people, real life stories in a pure state, with a straight talking too. Many in the Media should be learning from her Experience, so that we will probably be pleased to watch more documentaries on French TV… well in my opinion... sure, another French and Ethics Consumer Reporter like "Elise Lucet" is really Performing. Mireille was not only a Beauty, or great sense of humour but also a clever woman, humble, compassionate and full of loving kindness. It is no wonder that we are Loving and admiring her. Documentaries made her enhance Life and enables her to grow Humanly. Decorations: Officer of the Legion of Honour and Commander of the National Order of Merit. Rest in Peace Dear Madame Mireille Aigroz. That’s all for now. I wrote this article in purpose to reach out to those who will get to know more about Mireille Darc for her talented director career in particular.